There are 35 MIE from Egypt that are working closely with Microsoft to communicate a vision for communication. Believing in the power of technology in education to create social economic opportunities in Egypt, Microsoft Egypt in partnership with the Egyptian Ministry of Education celebrated the top 14 innovative educators from across the country. Microsoft Innovative Educator (MIE) program is designed specifically for teachers to be able to interact with Microsoft products to bridge the gap between technology skills and innovative teaching and increase their knowledge of how technology can increase productivity in the classroom. Microsoft Innovative Educators are selected based on their innovative use of classroom technology – from cloud storage to mobile and everything in between. They integrate progressive pedagogy with advanced technology to advance learning and better prepare students for their future jobs. They also help disseminate their knowledge to other educators through training, social media and blogging. The honoring ceremony was attended by Mark East, General Manager for Microsoft World Wide Education–, Khalid Abdel Kader, Microsoft Egypt GM, Noha Labib, Education Sector Lead and Rasha El-Ashry,Senior Partners in Learning Manager at Microsoft. From the Ministry of Education, Mohsen Abdel Aziz, Head of Central Management of Information Systems and Technology, also attended this ceremony. Out of a community of educators from around the world, there are 35 MIE from Egypt that are working closely with Microsoft to lead innovation and communicate a vision for education. Dr. Moheb El Rafei, Minister of Education, stressed on the critical role played by the technology industry in partnering with today’s educators to ensure the success of our students and the education system which relies on technology through innovation and creativity. 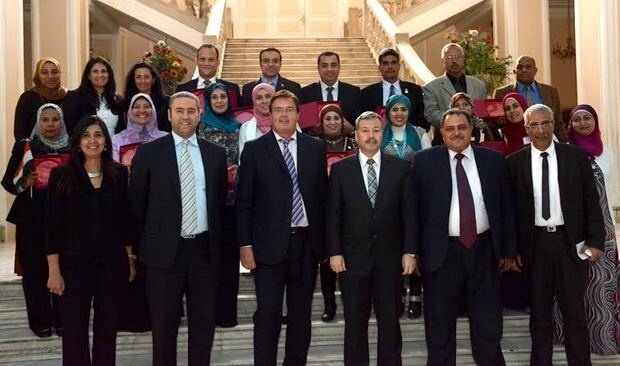 "A number of programs were designed in cooperation with Microsoft to help improve education outcomes in Egypt,” he said. In line with this commitment, East also announced the availability of Microsoft’s Office 365 ProPlus Benefit, a program available to students and teachers allowing them to install the latest version of Office with no additional cost as in recent research, Microsoft Office skills was listed as the third most important skill required by employers. Khaled Abdel Kader, Microsoft Egypt General Manager, stated that Microsoft is now contributing in training 100,000 educators – over the course of five years – on the use of the latest technology means. It is also working on multiplying this number. He also stated that the Microsoft IT Academy Program has more than 15,000 member institutions around the globe and more than 1,400 in the Middle East and Africa region that get access to a wide range of digital curriculum resources leading to a globally recognized certification at various levels of technology skills from beginner up to advanced levels.